At today’s U.S. 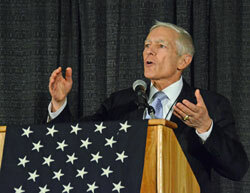 Custom Harvesters luncheon, sponsored by New Holland, retired General Wesley Clark took the stage. Gen. Clark says his passion was the military and now his passion is national energy security and the move away from dependence on foreign oil. I have recorded his remarks for you to listen to or share below. Gen. Clark is the co-chairman of Growth Energy. The U.S Custom Harvesters conference is taking place co-located with the 2013 AG CONNECT Expo in Kansas City, MO.